Did Chloie Leverette and seven year old Gage Daniel die in the fire at their home, or are they missing? 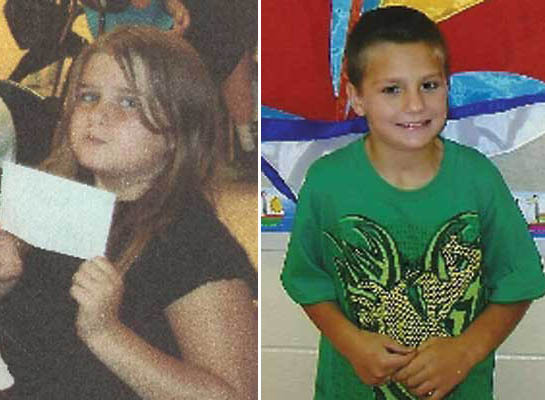 Nine year old Chloie Leverette and seven year old Gage Daniel missing after house fire. An AMBER ALERT has been issues for 9 Year Old Chloie Leverette & 7 year old Gage Daniel after first believed dead in fire. Chloie Leverette and Gage Daniel were first thought to have been killed when a fire destroyed the Unionville, TN at the at 730 Kingdom Road home where the children lived with their grandparents Molli and Leon McClaran on September 23, 2012. Sadly, the grand parents were killed in the fire; however, there was no remains found of the two siblings. Investigators found no trace of Chloie or Gage. The cause of the fire is still under investigation. The children had lived with their grand parents for the past 5 years. The children lived with the grand parents as one of the bio dads was deceased; however, their other bio parents had extensive criminal histories. The children have not been seen since before the fire Sunday night. Authorities in Tennessee have issued a statewide Amber Alert for two young siblings who have missing since their grandparent’s home was destroyed by a fire. We don’t know where they are,” Tennessee Bureau of Investigation spokeswoman Kristin Helm told WSMV-TV. “We don’t have any indication that they’re in another state.” Authorities issued the alert late Friday evening after investigators spent a fifth day trying to determine if there were any remains of the children in the fire debris. The children, identified as Chloie Leverette, 9, and Gage Daniel, 7, were living with their grandparents at the house that burned Sunday night and early Monday. 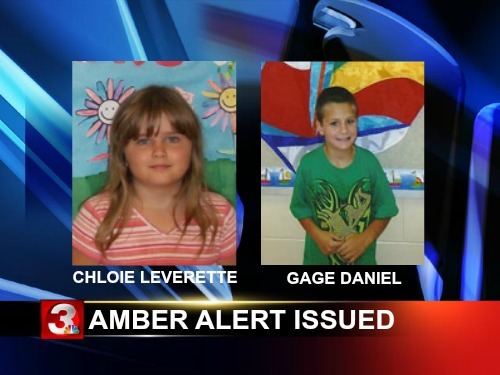 From WSMV, The TBI have issued a statewide Amber Alert after 9-year-old Chloie Leverette and her half-brother, 7-year-old Gage Daniel were not found after investigators sifted through the ashes. Authorities said they don’t believe 9-year-old Chloie Leverette and her half-brother, 7-year-old Gage Daniel, died in a fire that incinerated their home Sunday night, but there is also no indication where or when they could have gone. The Tennessee Bureau of Investigation issued an Amber Alert for the children Friday evening after previously issuing an endangered child alert on Wednesday. Crews spent five days sifting through ashes by hand at the burned home of the children’s step-grandparents, Leon McClaran, 72, and 70-year-old Molly McClaran, who died in the fire. The TBI said they’re working on a lot of leads in the case, but that has not yielded any results. All of the interviews they’ve conducted indicate the two missing children were actually in the house at the time of the fire. But, state bomb and arson investigators had said Wednesday that the children were not victims of the fire and their whereabouts remain unknown at this time. Chloie is described as a white female, approximately 4’8″ and 75 pounds, with brown hair and hazel eyes. Gage is described as a white male, approximately 4′ and 75 pounds, with brown hair and hazel eyes. If you have any information concerning the current whereabouts of Chloie and Gage, please contact the TBI at 1-800-TBI-FIND. UPDATE I: Christopher Daniel, Gage’s father says he thinks the two children did not die in the fire. UPDATE II: Anthropologists from the University of Tennessee and Middle Tennessee State University have been brought in to assist Investigation. Anthropologists from the University of Tennessee and Middle Tennessee State University have been brought in to assist State Bomb and Arson investigators as well as the Bedford County Sheriff’s Office and the TBI. The siblings were last seen by a neighbor around 6:30 p.m. Sunday night near their home. Investigators said the fire started three hours later. NewsChannel 5 learned Chloie showed up for school last Friday, but Gage did not. TBI officials also said they have questioned the children’s mother, and they believe she doesn’t have the children or know where they are. The Tennessee Highway Patrol flew over the area Wednesday with a helicopter using infrared cameras to search for the bodies. Investigators used cadaver dogs to search the home Tuesday. The fire was very intense and quickly collapsed the walls of the house. Firefighters spent several hours battling the flames overnight Sunday and early Monday, but they were hindered because the house sat far back from the road and was not near a hydrant.